The Pacesetter Legacy Wall is the Making Strides Against Breast Cancer fundraising hall of fame. Our Pacesetters are an elite group who go above and beyond in raising funds to help save live from breast cancer and this is where we recognize and thank them. Please note that each Pacesetter is listed alphabetically by first name. Larry Gaynor founded TNG Worldwide, a proud supporter of Making Strides Against Breast Cancer, in 1985 to provide manicurists with the supplies they need to do business. He and his wife Teresa, vice president of TNG, have taken the same skills they used to grow their company and put them to use to support Making Strides events. They even encourage their employees to participate in the event by offering bonuses and incentives for fundraising. Since 2001, his company has raised more than $1.7 million for the Making Strides event in Detroit. Individually, during that time Larry has raised more than $940,000, making him a Pacesetter many times over and one of the leading Making Strides fundraisers in the country. Through his dedication and tireless work, he has helped save countless lives from breast cancer. Neva Weber was a passionate and courageous woman who was a mother, a wife, a friend, and a national leading Making Strides Pacesetter who bravely fought Stage IV metastatic breast cancer. Unfortunately, Neva passed away on February 6, 2017 after a long battle with the disease, but her legacy will live on as an avid fundraiser who raised over $500,000 for this cause that was near and dear to her heart. Although initially skeptical about participating in a Making Strides event, Neva was encouraged to attend by her nurse practitioner. She found a welcoming community ("her people" as she called them), and she discovered a mission. When Neva and the "Westport Babes" team raised money, it was with a passion and ferocity that needed to be seen to be understood. Neva was determined and dedicated to raising funds for the American Cancer Society to help advance cancer research. In 2015, she personally raised more than $114,000, making her the top fundraiser in the United States. Neva will always be an inspiration and a reminder of what one individual can do and what is still left to be done. "Neva's level of dedication went beyond fundraising. She was always available to share her story with the hope of increasing awareness about screening and late-stage breast cancer. She touched so many others going through their own battles, and was always willing to listen and give a hug and words of encouragement. She will be missed by everyone who knew her, but never forgotten." 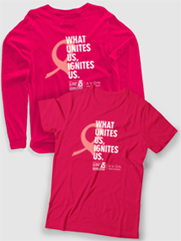 — Kristen Welton, community manager, Making Strides Against Breast Cancer of Westport. Stacy Matseas has raised over $1.3 million for Making Strides Against Breast Cancer, achieving national leading Pacesetter status. She participated in her first Making Strides event after her friend Victoria was diagnosed with breast cancer in 2000. She initially organized a team through her employer before eventually starting her own, "Stacy's Circle of Friends". Both of these teams continue to raise upwards of $50,000 a year each in donations for the American Cancer Society. Stacy has been presented many awards over the years including the American Cancer Society's prestigious St. George National Award in 2011 and the 2006 Volunteer of the Year Award for San Diego County for her dedication to the Society and its mission. And somehow, while doing all of that, she's found time to be a Road To Recovery driver, helping cancer patients get to and from their treatments. Stacy Matseas has shown an uncommon passion and determination. There is no doubt that she has helped saved countless lives from breast cancer through her efforts. Sue is a breast cancer survivor and has been a Pacesetter for 10 years raising over $1 million since she started participating in the Westchester, NY event in 2004. As a teacher, Sue is passionate about teaching the importance of philanthropy to children, and has made a huge impact on the community through what she teaches others about giving back. She has involved her students and her daughter’s friends in helping to fundraise for the Making Strides walk. Sue is married with two children and in her free time helps produce the Pleasantville music festival.